There is not only one, but two dining halls for on campus residents and UCCS students: the Lodge, which is located in Summit Village, and Roaring Fork located in Alpine. With both dining halls in addition to the campus restaurant and food court, students have plenty of options when choosing where they want to have their next meal. During 2014, construction began on the Roaring Fork. This was a need for the university, due to not only the campus population growing each year, but also to better accommodate on campus residents. Shortly after the Roaring Fork went up, the Lodge was renovated to create a bigger seating area for the campus community. Both dining halls are open to students, faculty and staff. 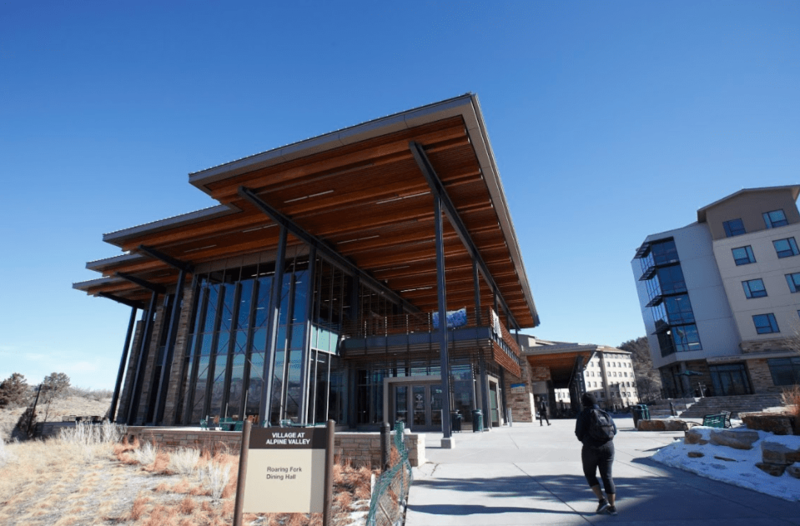 Although both of these dining halls are relatively equal in terms of design and space, the majority of students say they prefer the Roaring Fork — this is mainly due to its wider variety. Amanda Winter, a freshman studying pre-med, also shared that she prefers the Roaring Fork, since it is closer to where she lives. Despite this statement she said that the Lodge always has what she is looking for. “They always have pasta and hard serve ice cream,” said Winter, while the Roaring Fork does not. Freshman engineering major, Kevin Washington, prefers the Fork as well due to the quality of food. “The Fork has a little more variety than the Lodge,” said Washington. Madison Dempsey, a freshman studying biomed agrees. For her though there’s another reason why she likes the Fork more than the Lodge. “I really like that the Fork has blenders for smoothies,” said Dempsey. While a majority of students would prefer to eat their meals at Roaring Fork, Shawna Arbuckle, a freshman studying biomed, says it depends on the day. “I eat at the Fork on the weekends when the Lodge isn’t open, but the quality of food is not that much better,” she said. While a lot of students may eat at the Lodge, they agree that if the Fork was closer they would eat there. The majority seems to favor the Fork, however there is differing student opinions about which food option on campus they prefer.